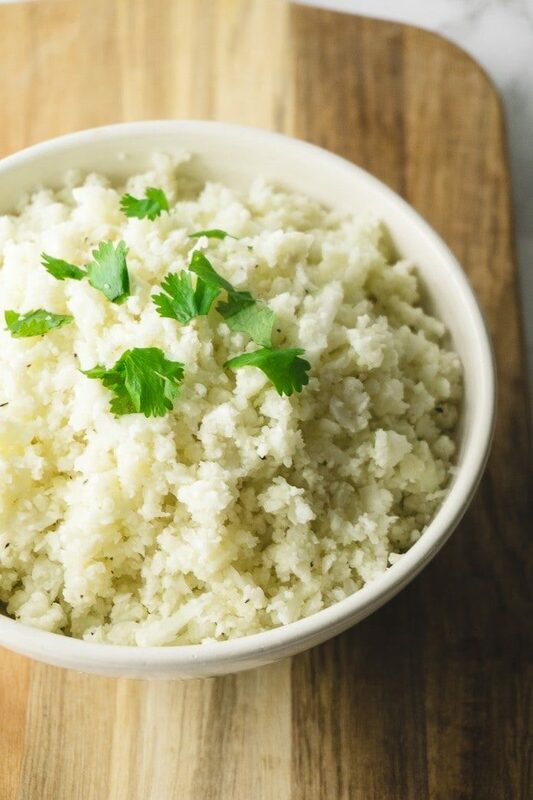 Cauliflower rice is one of the most popular keto side dishes — and for good reason! It’s quick to make, packed with nutrients, and a perfect low-carb substitution for traditional rice or couscous. If you’re looking for a keto rice recipe, read on! Cauliflower is such a versatile vegetable. On its own, cauliflower’s flavor is very neutral. So it’s easy to flavor with your own spices and seasonings. It’s tender when cooked, but it still holds it’s “rice-like” shape. It’s naturally low-carb and super delicious! No wonder it’s a favorite of cooks on a low-carb diet. Cauliflower is one of the healthiest cruciferous vegetables you can buy. It’s loaded with nutrients including fiber, vitamins C, K and B6, and potassium. Cauliflower has 25 calories per cup, 5g total carbohydrates, and only 2.9 net carbs. Cauliflower rice, or “cauli rice” as it is sometimes called, is easy and fast to make. It’s simply cauliflower cut up into small pieces that are about the size of a grain of rice. You can eat is raw in salads, or cooked in hot dishes. 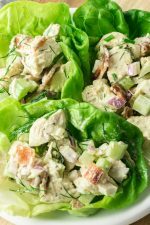 Plus, it makes a delicious side dish to serve alongside keto main dishes. You can use it to make keto fried rice, in keto stuffed peppers, with keto chicken curry, or alongside any dish that you would normally serve rice. One pound of cauliflower will yield about 4 cups of “rice.” A large head of cauliflower weighs 1.5 to 2 lbs, and will yield about 6-8 cups of “rice”. 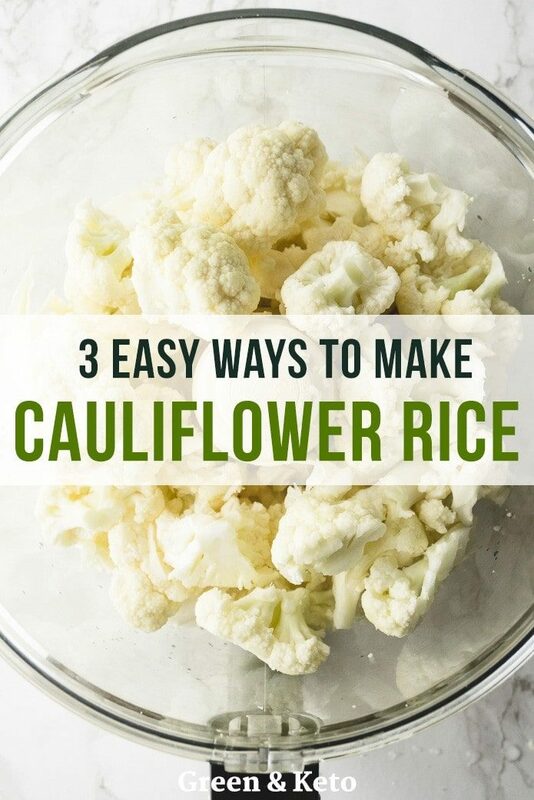 If you’re looking for a great way to sneak more veggies into your low-carb diet, read on to learn 3 easy ways to make “rice” out of cauliflower. The simplest way to make cauliflower rice is to chop it into rice-size pieces with a large chef’s knife. First, remove the outer leaves and the stem. Then, quarter the cauliflower, and remove the core. Work through each quarter, mincing the cauliflower into small grains of “rice”. Now, admittedly, this method does take the longest amount of time. But, it doesn’t require any special tools or equipment besides a knife and a cutting board. So if you don’t have a box grater or a food processor, you can still make cauliflower rice. Plus, it’s a great way to practice your knife skills, haha! 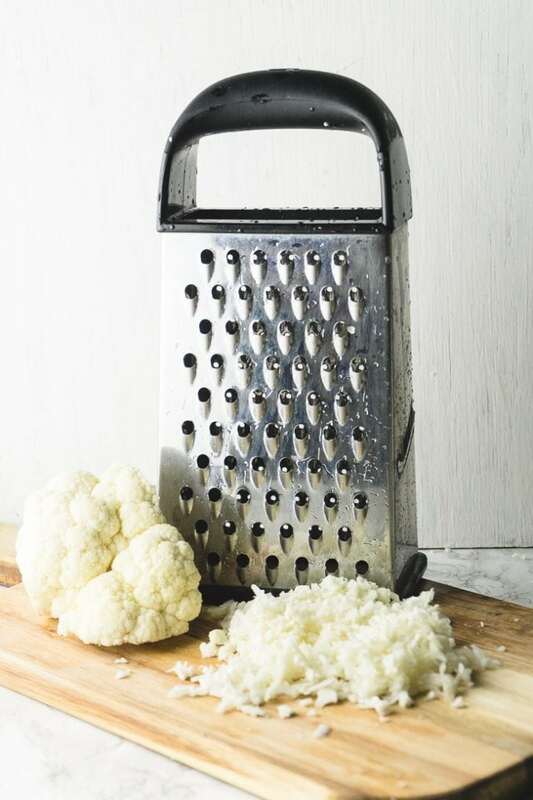 You can also make cauliflower rice with a box grater or a Microplane-style grater with medium-size holes. 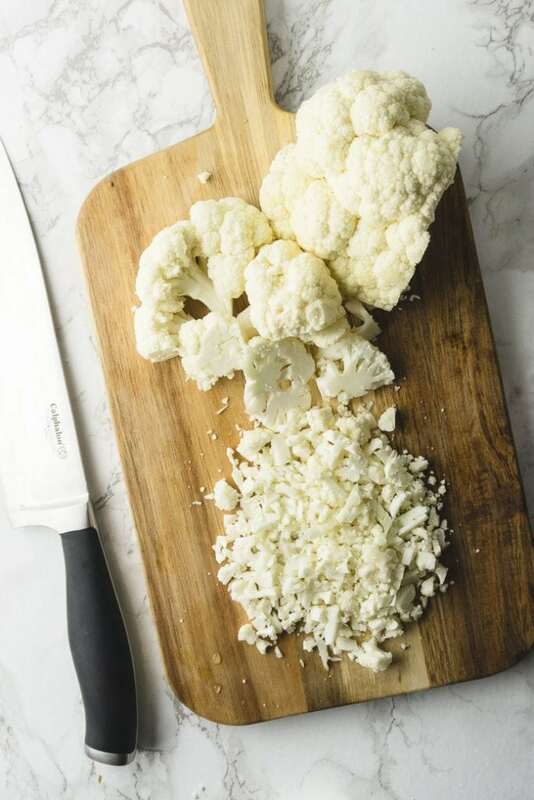 First, use a knife to cut the head of cauliflower into large florets — keep them on the larger size so they are easy to hold. Push each floret across the holes of the grater to make rice-size pieces. The third, and fastest way to make cauliflower rice is in a food processor. First, use a knife to cut the cauliflower into medium-size florets — just small enough so they will fit inside your food processor bowl. Fill the bowl of the food processor about 3/4 of the way full. You’ll want to leave enough room for the cauliflower to move when you turn the food processor on. Depending on the size of your head of cauliflower, you may need to process it in batches. Pulse the cauliflower until it is chopped into small pieces. If pieces get stuck, you can remove the lid and use a spatula to scrape the sides of the bowl. Take care not to process too much — you don’t want mush! If there are a few stubborn large pieces, remove them from the bowl, pour out the cauliflower rice, and process those large pieces again. Once you have your cauliflower rice chopped, it’s easy and quick to cook! To cook cauliflower rice on the stovetop, you can sauté it in a large skillet over medium heat in 1 Tbsp oil. You can cover the skillet with a lid for the first 5 minutes of cooking so that the cauliflower steams and becomes more tender. Remove the lid and cook for an additional 3-5 minutes, stirring occasionally. When the cauliflower rice is tender, season as desired, and serve. You can also steam cauliflower rice. Steaming might be the fastest way to cook cauliflower rice! To steam cauliflower rice, add the raw rice to a steam insert. Cover and cook for 3-5 minutes, or until the cauliflower rice is tender. To cook cauliflower rice in the microwave, place the cauliflower rice in a microwave-safe (glass or porcelain) baking dish. Cover with a microwave-safe lid, or plastic wrap, and microwave for 3 minutes (or 5 minutes from frozen). Then, remove the cauliflower rice from the microwave, carefully lift the lid or plastic wrap (watch for steam), and fluff with a fork. One of the great things about cauliflower rice is that it freezes really well. And you cook cauliflower rice straight from frozen without going through the trouble of defrosting it. This makes cauliflower rice perfect for meal prep. 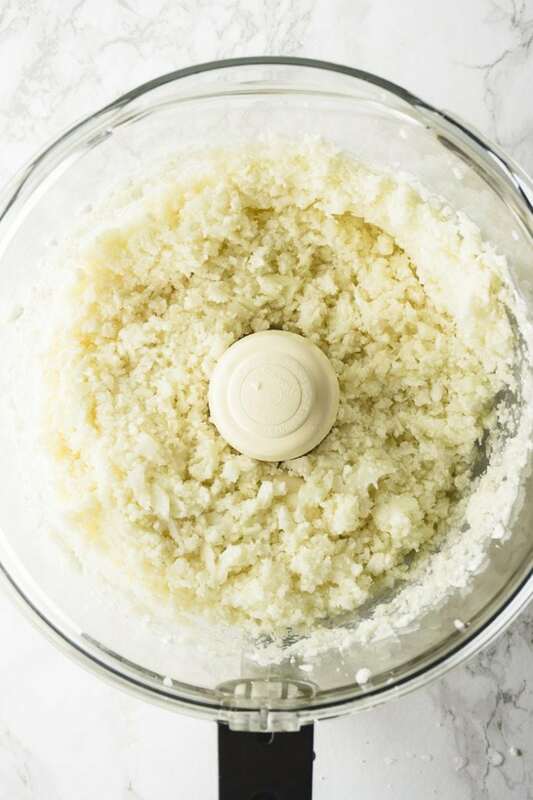 Because I don’t know about you, but if I’m going to go through the trouble of cleaning my food processor, you can bet I’m going to make it worth it by making a big batch of cauliflower rice. So make a big batch, and then freeze individual portions in a zip-top plastic bag for the next time you need it. To freeze cauliflower rice, simply transfer the raw, chopped cauliflower rice to freezer bags, and lay flat to freeze. 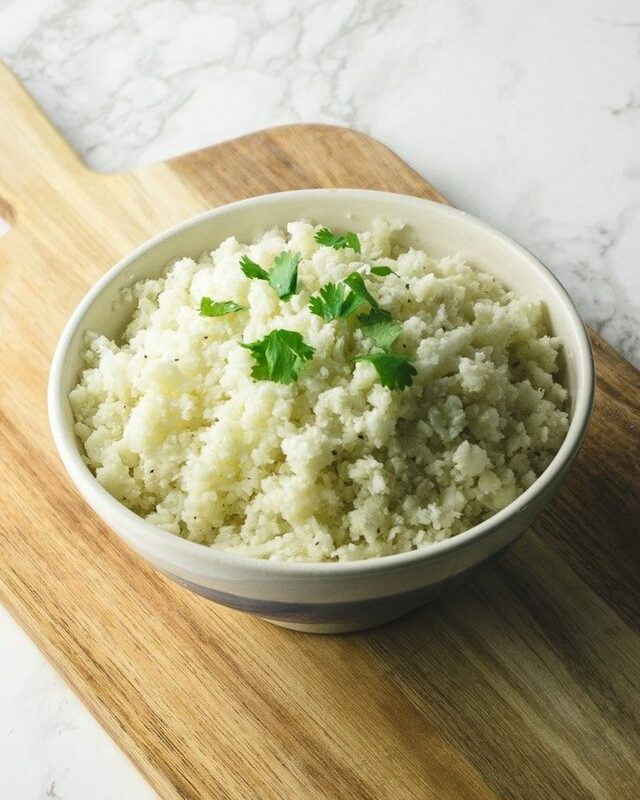 You can store uncooked cauliflower rice frozen in your freezer for up to 3 months. To cook cauliflower rice from frozen, you can saute it in a covered skillet for 10-12 minutes. (Just like you would for fresh cauliflower rice.) If your frozen rice is one big block, you’ll just need to stir it more often to break it up. 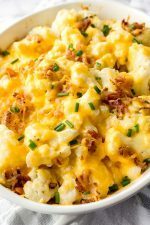 Cauliflower is very versatile, and can go with a variety of keto main dishes. Try it with Dutch Oven Roasted Chicken, Sheet Pan Chicken Fajitas, or Creamy Mushroom Chicken Skillet with Parmesan and Bacon. 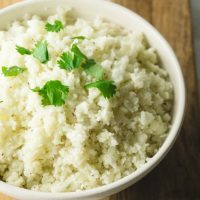 Cauliflower rice is a delicious and naturally low-carb side dish to serve alongside all of your favorite keto dinner recipes. 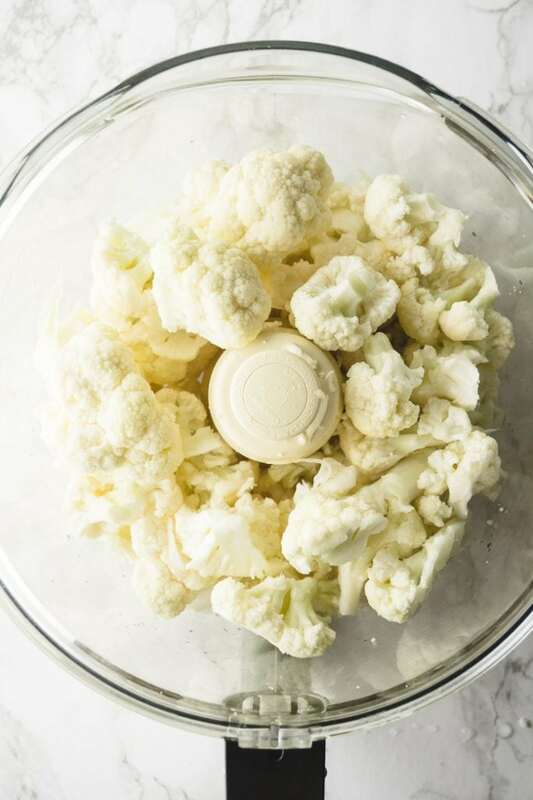 Food Processor Method: Use a knife to remove the outer leaves and stem of the cauliflower. Cut the head of cauliflower into quarters and remove the core. Cut into large florets that will fit in your food processor bowl. Fill the bowl of the food processor 3/4 of the way full with florets. Pulse until the cauliflower is the size of rice grains. Scrape the sides of the bowl as needed. Repeat in batches until the whole cauliflower is processed. Stovetop Cooking Method: heat 1 tbsp of oil in a large skillet over medium-high heat. Add the cauliflower and stir to coat. Cover the skillet, and allow the cauliflower to steam for 5 minutes, removing the lid to stir occasionally. Remove the lid and cook for about 3 more minutes, until the cauliflower rice is as tender as you'd like. Season as desired, and serve. Read the post above for more preparation and cooking methods. 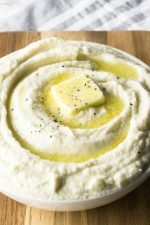 Creamy Keto Mashed Cauliflower "Potatoes"